Madison Square Garden 40 years after! 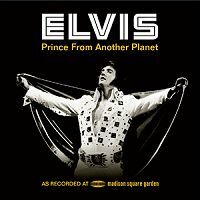 A 2-CD / 1 DVD edition of Madison Square Garden shows in the Legacy series. CD-1 contains the afternoon show, first released in 1997 on An Afternoon In The Garden". It comes in a new mix this time. The same certainly goes for the main show as found on CD-2. The DVD contains 20 minutes from the (not yet fully released) press conference on June 9, and amateur footage from the afternoon show on June 10 (as found on CD-1). Quality is quite good, and the sound is perfectly synced. This new Legacy Edition has been produced by Rob Santos and Ernst Mikael Jørgensen. 1) 20-minute 'mini documentary' featuring footage from Elvis' June 9th press conference, the June 9th evening show and the June 10th afternoon show, plus new interviews with Lenny Kaye, James Burton and Glen D. Hardin, Joe Guercio, Jerry Schilling and George Kalinsky. 2) The complete WNBC-New York film of the June 9th press conference. Approximately 12 minutes.